GE60 and GE60X gigabit Ethernet wireless links are the first affordable products to provide highly-available wireless connections at full GigE data rates. 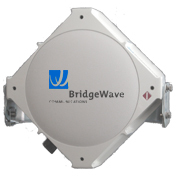 These point-to-point links transmit and receive simultaneously at full-rate GigE speeds (1.25Gbps) with very low latency, providing the performance of physical fiber over a highly-secure wireless connection. GE60 links consist of a pair of fully-integrated outdoor radios that connect directly to the end-user's GigE switches or routers. The radios can be mounted on masts, on building walls, or even placed inside of windows, and are easy to install and maintain. To deploy and operate the systems, simply connect a pair of fibers and a pair of low-voltage power wires, then aim the radios, using the unique visual alignment tool, to point at one another. GE60X links feature two-foot, mast mounted antennas with detatchable radio units, allowing the radio to be serviced without removing or realigning the antenna. GE60X links offer up to twice the range of GE60 links, enabling users to reach up to four times as many remote sites from a given location. 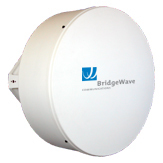 Due to the larger antenna size, and narrower beamwidth, we recommend that these links be professionally installed. Enterprise customers use GE60 and GE60X links to extend their LAN backbones between nearby buildings, or to connect their buildings over longer distances via metro fiber backbones. By extending LAN backbones between buildings, users can centralize servers to save IT costs and simplify administration, or distribute servers between buildings to provide for rapid disaster recovery. GE60 links are commonly used across multiple industries, including education, healthcare, government, finance, and media segments, as well as any application that requires connectivity between multiple buildings. Network operators use GE60 links to provide private network services to enterprise customers or to implement "virtual fiber" distribution networks to deliver broadband services to residential or business users. GE60 links naturally combine with fiber optic cabling to create highly cost-effective hybrid fiber-wireless networks, where each technology is best suited. Full Gigabit Ethernet Performance: 1000BaseSX interface. Full duplex, full rate, non-blocking. Latency below 50 microseconds. License-Free Performance: 60GHz license-free spectrum (US and Canada). Virtually Interference-Free Operation: Narrow, point-to-point beams and the oxygen absorption properties of the 60GHz spectrum provide immunity to interference and allow co-location of multiple links. Easy to Install and Maintain: Simple, intuitive installation and visual alignment tool for basic alignment. No maintenance required. Highest Quality: Every unit is subjected to state-of-the-art highly accelerated system screening (HASS) to prevent pre-mature field failures. Forward Error Correction: Allows error-free operation at one-quarter of the receive signal strength of competing units, providing 20-30% longer link distances.